- Clean the iron surface of rust, dirt and paint leaving a nice clean surface. - Remove the salts absorbed over time by iron. This is especially seen with salt water or marsh recovered shells. If not done correctly the iron will disintegrate over a short time period. We can perform any type of cleaning electrolysis. This includes cleaning and coating of your shells. Pricing is generally in the $20-50 range, but some complex jobs are more. Drilling to clean the interior of powder can be done too for an extra charge. We are very soon to be able to do long-term electrolysis of saltwater recovered shells. If interested in this service, please let us know. You are talking about 9 months to 2 years for this type conservation. 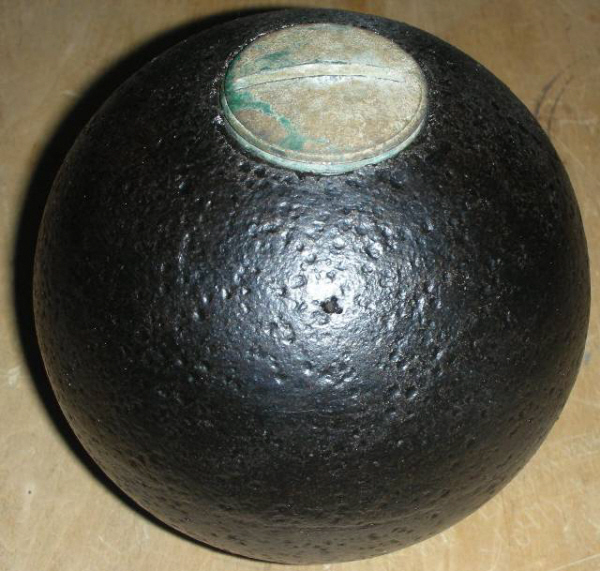 The picture shown here is of a rare 12pdr Broun percussion fused cannon ball. It was recovered without the fuse. I ran it through electrolysis and chased the threads to accommodate the Broun fuse shown in Chuck Jones book which I had acquired earlier. The fuse screws in and out, but it was delicate work to accomplish because the anvil cap was ever so slightly out of round. This shell is not for sale but merely shown here to illustrate one of the pieces we've done. We also have many of the taps required to chase threads of shells to remove any rust in order for them to once again take the appropriate fuse.